06.28.11 On May 28th, 2011, eight players gathered in Houlton, Maine to participate in the First Houlton Invitational Tournament open to players rated over USCF 1600. Roger Peterson of Calais won the event with 3.5 points in four games. Here's the tournament report with USCF crosstable. Players competing at the First Houlton Invitational Tournament (clockwise from lower left): Tournament winner Roger Peterson, Todd Snyder, Tom Sandford, Roger Hardison, Lance Beloungie and Richard Fontinha. Roger Peterson scored consecutive wins over Lance Beloungie, Richard Fontinha and Roger Morin in his first three rounds then took a draw in his last round game with Ray Haines to finish the First Houlton Invitational Tournament in clear first place with 3.5 points. Roger Morin, Todd Snyder and Ray Haines tied for second place each scoring 2.5 points. Tom Sandford was the sole 2.0 point getter in the tournament to take fifth place. Richard Fontinha and Roger Hardison put up 1.5 points and Lance Beloungie ended the day scoreless to round out the eight-player crosstable. We look forward to more invitationals accross the state. 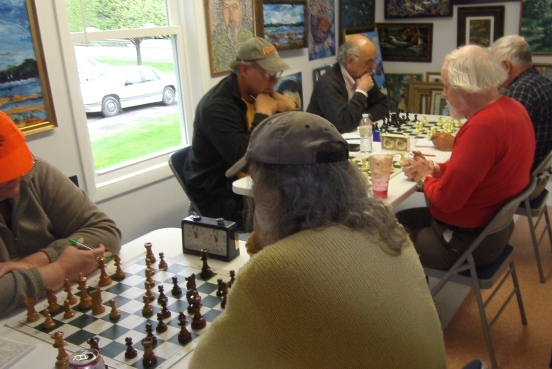 It's hard to tell where the art ends and the chess begins in this shot of Roger Morin (left) and Ray Haines during their second round game at The Art Studio in Houlton. 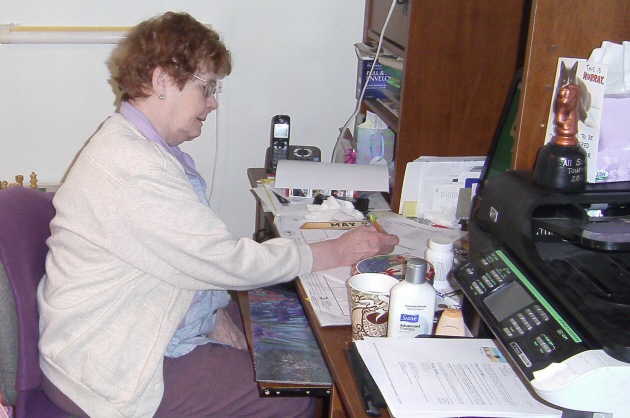 Tournament Director Lois Morin at the controls.